I had the good fortune to catch up with Guitarist Todd Grubs and ask him some questions. Todd is an interesting character, and without doubt a great composer of music for the Electric Guitar. Interestingly enough he prefers to compose instrumental pieces, although as he pointed out he is also associated with projects that are of a more traditional nature as well. The Title for the CD Time, Space And The Electric was inspired by a Dr. Stephen Hawking book that he recently read. I think that snippet of information is quite important, I think it is a clear indication of the type of person Todd Grubbs is, intelligent, and clearly a thinker. I cannot think of many musicians that I know curling up with a Dr. Hawking book! Time, Space And The Electric features a plethora of guest artists, but as Todd explained most of the appearances were via the Internet. Todd and his regular trio layed down the basic tracks, and the guests added their own tracks remotely. The final product was then stitched together in Todd’s private studio. The end result is seamless. One track in particular You Are Here showcases how you can harness the power of the studio, it features a Moog solo by Don Preston. I am still incredulous that he was not playing live. You can listen to the entire interview here, and you will also get to hear three tracks from this very fine CD including Don Preston on the Moog. You can find out more about Todd Grubbs on his web site. 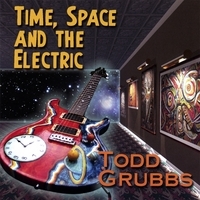 1 user commented in " An Interview With Rocker Todd Grubbs "